Keep your most important debit/credit cards and a little bit of cash handy with the Sweet Flowers Credit Card Holder! This is absolutely perfect for carrying on the go or keeping your most used cards in an easy to find spot in your purse. No need for a full wallet … you only need this little holder! 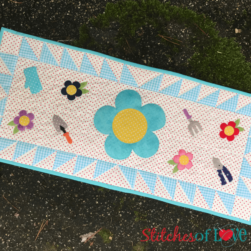 You will have a lovely time making this … and it makes a great gift for friends! PDF Downloadable Pattern will be available to download from your receipt and also available in your account under “Downloads”. 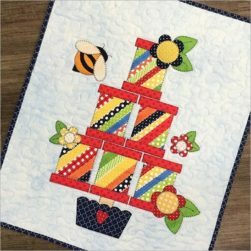 The Sweet Flowers Credit Card Holder PDF Downloadable Pattern includes step-by-step instructions, an applique placement guide and all applique pieces reversed for easy tracing. The Sweet Flowers Credit Card Holder is made with fabrics by quilt shop quality fabrics by Riley Blake Designs and LakeHouse Fabrics.